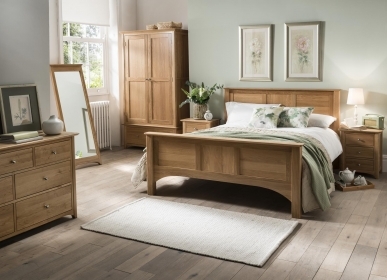 A stylish feature in any bedroom, the Country 3 drawer bedside table is expertly hand built from pure American White Oak, using the most traditional of techniques. With ample storage space, the table would bring a refreshing feel to your bedroom. The bedside table features dovetail jointed drawers and tongue and groove backs and bases, as well as curved metal handles. The brushed oil finish adds a cheery note.